This is a sponsored post with affiliate links. Affiliate links provide a portion of your purchase to my blog with out costing you any additional money. All opinions are mine. 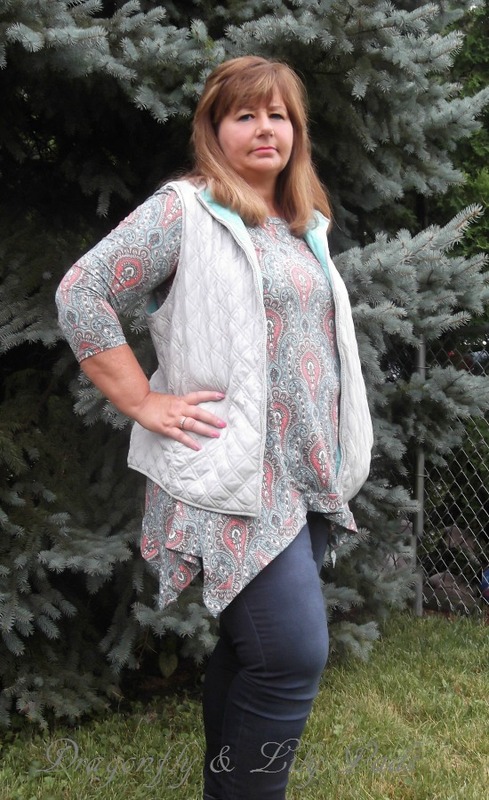 Darlins' I am excited to share my new outfit with you from Glamour Farms Boutique. I attend conferences and classes to bring you the best blog experience here on D&LP. The conference I attended two weeks ago included a fashion company from right here in the Midwest. Happy Dance!!!!! I Loved the clothes of a few of the ladies at the event the last two years. This year I was going to ask wear they bought their outfits. Hooray! Glamour Farms Boutique is where they buy their clothes. 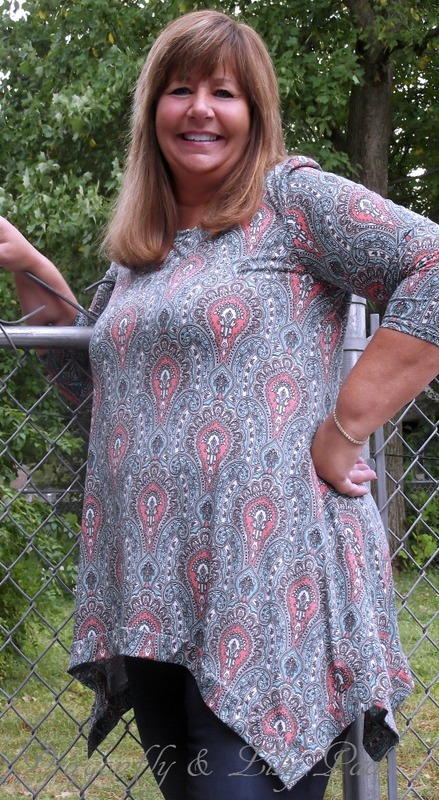 Even better is the range of sizes fit the tiny to curvy lady in a comfortable flattering style for all of us. I don't think there is enough dancing room in this post. Dancing on the Ceiling!!!!! You may wonder why I decided to add clothing to this DIY based blog? We all wear clothes! I can bet many of you also want to feel beautiful in what you wear everyday just like me. How could I not share the most comfortable flattering clothing with you when I have finally found them? Darlins' I can not leave you out of this exciting find. Style Sunday Series will start with a once a month post on Sunday to share my new outfits. If you love the SSS then we will keep it going? I hope you will love it as much as I do! I Love DIY and I am a girl who likes to feel beautiful inside and out. Now that we have all of the details out of the way on with the show. I have a secret under my clothes. The Latte Shaper is a girls best friend. Keeping all my bumps and bulges held snugly all of me into a lovely smooth curvy lady that I am. The Shaper comes in different styles making it an item to include in creating you look. Lets talk about the outfit itself now. We all know that Shark Bites are in and they flatter all kinds of figures. The print top named,"Pretty Please Corral." Is a perfect size. Who doesn't love Corral with Turquoise? With three quarter length sleeves this piece can last you through all seasons in the Midwest. Are you ready to talk about the Jeans? Oh My Gosh! I wish you could touch these through your phone or computer. I am talking the most comfortable jeans I have EVER put on. They feel like you are wearing leggings or better yet pajamas! The color is rich making you feel like a million bucks. I paired them with a stacked wooden heal sandal for early fall look great from my closet. Prince Charming might take me on a date night. The big chill will come which has me adding a boot and quilted vest which are out from my stash. Be sure to check Glamour Farms for your accent pieces and jewelry too. With out further Adieu, let me introduce you to Glamour Farms Boutique. The company is based in Illinois which is where I have lived all my life. I love to support the state businesses. The owners of Glamour Farms Boutique is an amazing group of women know there customer. I tried on two pair of jeans to get my size just right. That is a first in my lifetime! 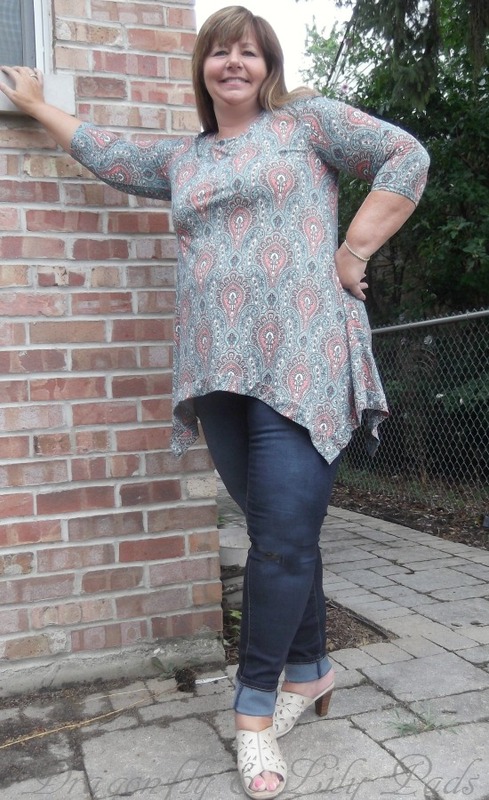 I am wearing the BTQ Curvy/ Stephanie Skinny(Medium Wash). Use this link to grab some Glamour Farms Boutique style. While you are there don't forget to use the special discount code below for your Dragonfly & Lily Pads Darlins' code only. You will receive a $10.00 off coupon by following the guidelines below. D&LP798 not valid after 9-11-2016. Each unique code can only be used one time on orders $20.00 and over with regular priced items only. Let your creative spirit Dance! I love your outfit! So flirty and chic. You look fantastic in it. You look beautiful and I adore the top. I may have to order some of those jeans specifically. By the way I love this series and your hair looks amazing. Love you! You look wonderful Karen! The outfit is so cute and it looks very comfy! You are just the sassiest thing ever in that outfit.!! You would make my momma proud! Love the photo with the vest. Attitude! Rock it girl. Thank you Kathy. Prince Charming is an amazing photographer. I was channeling my inner sassy. I am so glad you saw it in the pictures. You should try the clothing it is so comfortable yet stylish. My goodness this series is good for my ego. You should really try the jeans they are so comfortable. That is what I love about Glamour Farm Boutique. They bring out the flirty and make you feel pretty with affordable comfy style.